"Sampath Speaking" - the thoughts of an Insurer from Thiruvallikkeni: Grace Mugabe falls into disgrace !! 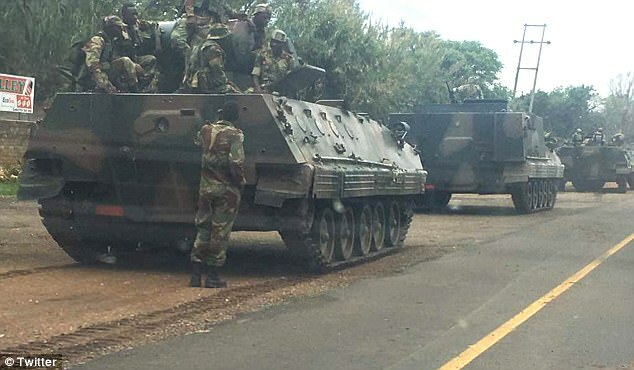 It is not ‘Crocodile tears’ but true tears of the crocodile .. .. .. media reports confirm that Zimbabwe's military has placed President Robert Mugabe under house arrest in the capital Harare. Zimbabwean president, Robert Mugabe, is being confined to his house by soldiers who surrounded his official and private residences, as well as other government buildings. BBC reports that Grace Mugabe, who was being positioned to eventually take over from her husband, has left Zimbabwe for Namibia. The sacked vice president, Emmerson Mnangagwa, was reported to have returned to Zimbabwe on Wednesday morning 15th Nov 2017 from South Africa, where he fled after being stripped of his office. The president of neighbouring South Africa, Jacob Zuma, however said he had spoken to Mugabe, who was “fine” and that he was sending special envoys to meet both Zimbabwe’s president and its senior army officers. Mr Mugabe, 93, has dominated the country's political scene since it gained independence from the UK in 1980. With tanks on the streets of Zimbabwe and enemies at the gates of his plush mansion, perhaps the globe is witnessing the end of Robert Mugabe’s remarkable and blood-stained rule over Zimbabwe? 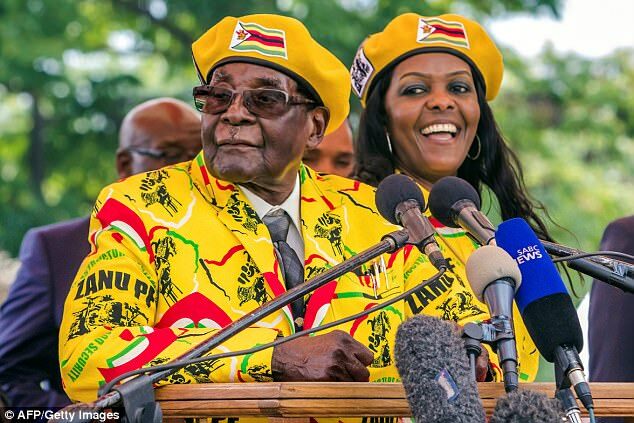 After 37 years running the nation, the old despot’s vice-like grip on the shattered ‘breadbasket of Africa’ has weakened, the like cause – his loathed second wife, Grace. Western media confirms that the man who has ruled Zimbabwe for 37 years looks deposed after a shock coup was orchestrated by the vice president he sacked last week. Robert Gabriel Mugabe was born on February 21, 1924 at a Catholic mission village near Southern Rhodesia's capital city, Salisbury. His father, Gabriel Matibiri, was a carpenter and his mother, Bona, was a religious teacher. He qualified as a teacher at the age of 17, later studying at Fort Hare University in South Africa, where he met many of southern Africa's future black nationalist leaders. It was during this period that Mugabe was introduced to Marxism by South African communists. He later embraced Marxist doctrine, but claimed that his biggest influence was Mohandas Gandhi because of his behaviour during the Indian struggle for independence. When he returned to Southern Rhodesia in 1952, he was 'completely hostile' to European imperialism. He headed to Ghana to teach in 1958, where he was influenced by president Kwame Nkrumah. Mugabe claimed tat went to the country as an 'adventurist' because he wanted to see what an independent African state looked like (Ghana was the first nation in the continent to win freedom from a European power). In 1980, he was elected Prime minister after independence elections; in the military actions in 1982 the Govt was accused of killing thousands of civilians. In 1987, the amended the constitution and became the President. In 2000, Zimbabwe witness turmoil and ugly scenes of land seizures owned by the While. In 2008, Mugabe and opposition candidate Morgan Tsvangirayi agreed to share power after contested election; Britain's Queen Elizabeth II annuled Mugabe's honorary knighthood. The elections were set to be held in 2018. Early this month, Mugabe fired deputy Emmerson Mnangagwa, appearing to position first lady Grace Mugabe for vice president post. In his early days, Mugabe repeatedly called for violence against white people in Rhodesia, lashing out at them in racist rants as being 'blood-sucking exploiters' and 'sadistic killers'. The freedom had been possible due to violent insurgency and economic sanctions forcing the Rhodesian government to the negotiating table. Mugabe took control of one wing in the guerrilla war for independence - the Zimbabwe African National Union (ZANU) and its armed forces - after his release from prison in 1974. His partner in the armed struggle - the leader of the Zimbabwe African People's Union (ZAPU), Joshua Nkomo - was one of the early casualties of Mugabe's crackdown on dissent. His second wife, Grace, the First Lady has been viewed as a front-runner to succeed her husband after decades of his vice-like grip on power. But now has ran away to Namibia. The man, Mugabe, aged 93, once heralded as liberator is seen differently by his own people. In the final decades of his rule, Mugabe - one of the world's most recognisable leaders with his thin stripe of moustache and thick-rimmed spectacles - has embraced his new role as the antagonist of the West. The man believed to be behind the coup in Zimbabwe is the country's recently sacked vice president, Emmerson Mnangagwa - also known as 'The Crocodile'. Mnangagwa, 75, is a notorious and much-feared figure in Zimbabwe, having led a vicious crackdown on opponents in the 1980s with the help of the dreaded North Korean-trained Fifth Army brigade. Thousands of civilians were killed during the Gukurahundi campaign, but Mnangagwa has always denied involvement. His reputation for cruelty is so legendary that he was one of the few leaders of Zimbabwe known to drive around the country without security. With Zimbabwe in turmoil, it perhaps is from one tyrant to another !! PS : Remember very well that famous 175 n.o. by the great Kapil Dev, retrieving the team from 17/5 against Zimbabwe. Earlier on 9th June 1983 In their very first one-day international, Zimbabwe announced their arrival with one of the greatest upsets in World Cup history, beating Australia by 13 runs at Trent Bridge. Brief scorecard reads : Zimbabwe 239 for 6 (Fletcher 69*, Butchart 34*) beat Australia 226 for 7 (Wessels 76, Marsh 50*; Fletcher 4-42) by 13 runs.. Zimbabweans had played with ease the renowned Australian pace attack of Dennis Lillee, Jeff Thomson, Geoff Lawson and Rod Hogg.